Port Collaborative Decision Making concept (Port CDM), part of the Sea Traffic Management Validation Project – STM and the winner of the Digital Enabler Award 2017 -meet the Project leader, Mikael Lind, Associate Professor, Research Institutes of Sweden, RISE Viktoria, who now has been bitten by the “shipping-bug” and loves Ports. How can the ports increase their efficiency by becoming digital? 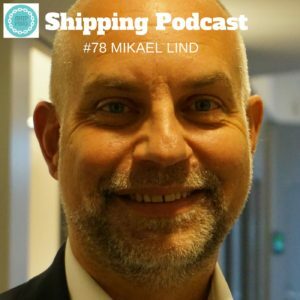 That is the question that Mikael Lind is answering in this the 78th episode of the Shipping Podcast. The Port CDM group made a map of all stakeholders involved in a port call, they call it “the metro-map”, you can find it on the Facebook page of the Shipping Podcast. When looking at the #metromap it becomes obvious that if all parties involved had the same information about what and when things will happen, a lot of time will be saved. And time is money. I love feedback! Social media, email, comments, anything you think is important to me. And that you share the Shipping Podcast with your friends and colleagues, we are on a mission here! by the way an acronym not in the IMO vocabulary. If using VTMIS perhaps the world would better understand this concept of service. Was recently presenting VTMIS to a group of pilots and port captains in the Gulf. In Cape Verde the idea is on its way to be introduced but limited and carefully conceptualised. A major question is who is going to pay. Another where to draw the line of classified information. Well, look fwd to read the outcome of this Swedish idea to improve maritime service and cut costs. I am the Communications Officer of the STM Validation project. Thank you for your reflection! VTMIS is, as I understand, about services based on monitoring ships. STM is built on the idea of actors sharing their information voluntarily. VTMIS is a EU Directive but STM is rather a global concept conceived in Europe. The STM initiative have been in contact repeatedly with EMSA to inform of the possibilities, but EMSA have replied that they are limited but their directives. STM continues to work with the industry, to find benefits for commmercial providers and customers which would drive its development. I believe that VTMIS could be combined with STM. For example the Danish Royal Navy monitors all Danish Waters. If a STM-enabled ship enters the Danish Waters, Denmark asks the ship for their voyage plan offering enhanced monitoring services in return. Would help avoid groundings and when more ships are connected even risk situations for collisions could be avoided. Who is going to pay? The users of commercial services that in its turn use the STM oinfrastructure. The exact setup will develop over the next years.